[SOLUTION] "The local policy of this sytem does not permit you to logon interactively." "The local policy of this sytem does not permit you to logon interactively." I have a domain lab (Windows 2003/2008) and want to give a user remote desktop to some servers and an XP machine. Simplest solution , add him to local admin on XP. Double-click System, and then on the Remote tab, click Select Remote Users. Click Add type in the user account name, and then click OK. If you are adding more than one user name, use a semicolon to separate the names. Note: Adding users to the Remote Desktop Group requires that you are logged on through an administrator account. In the right pane, double-click Allow logon through Terminal Services. Make sure that the Remote Desktop Users group is listed. In the right pane, double-click Deny logon through Terminal Services. Make sure that the Remote Desktop Users group is not listed, and then click OK.
Forgot to mention: I'm working in a domain, so I'm not setting it on the machine itself. 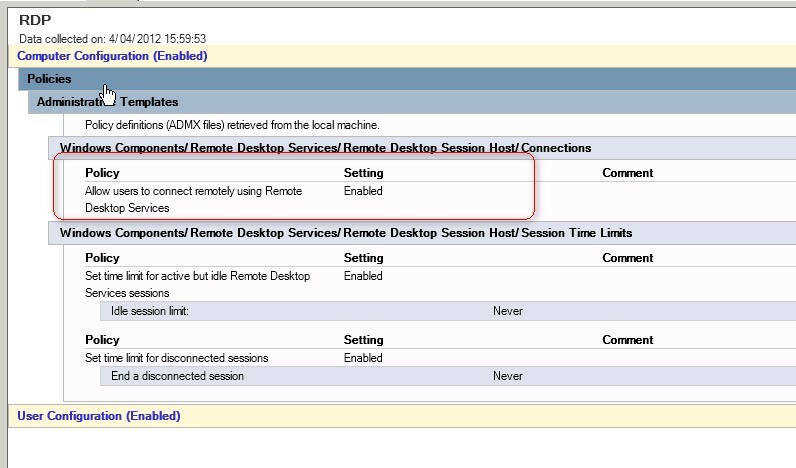 Isn't the remote desktop users group sufficient or should I also work via GPO? Adapted the policy, it is there (checked it) but still same message. Please advise. Do an RSoP on that machine. It will tell you what policies are being applied to the machine, and if any policies is prohibiting the user from RDPing. Take a look at what motnahpoo stated. Also logon directly on the machine, right click "My Computer", Properties and select the "Remote" tab. Make sure that one of the "Allow connection from computers etc." is checked and that "Don't allow connections to this computer" is NOT checked. Another question - can YOU remote into the workstation or anyone else (admin and non-admin)? Or is only the user having the issue? I have checked rsop and it is correct, local setting on machine also. Yes I can remote connect via RDP, that's how I connect always. I used a policy "restricted groups" and added the users to remote desktop users. This works. However, now I wonder why the ad group remote desktop users exists also.